Waiting on Wednesday is a weekly meme, hosted by Jill at Breaking the Spine that spotlights upcoming releases we can't wait to read! My pick is Sever by Lauren DeStefano! With the clock ticking until the virus takes its toll, Rhine is desperate for answers. After enduring Vaughn’s worst, Rhine finds an unlikely ally in his brother, an eccentric inventor named Reed. She takes refuge in his dilapidated house, though the people she left behind refuse to stay in the past. While Gabriel haunts Rhine’s memories, Cecily is determined to be at Rhine’s side, even if Linden’s feelings are still caught between them. Meanwhile, Rowan’s growing involvement in an underground resistance compels Rhine to reach him before he does something that cannot be undone. But what she discovers along the way has alarming implications for her future—and about the past her parents never had the chance to explain. 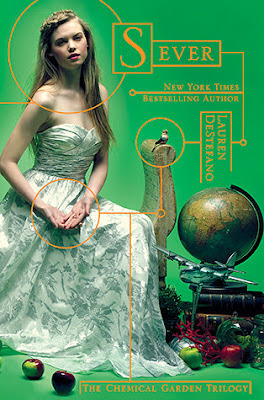 In this breathtaking conclusion to Lauren DeStefano’s Chemical Garden trilogy, everything Rhine knows to be true will be irrevocably shattered. DeStefano's Chemical Garden trilogy has got to be one of my absolute favorite series ever. Her gorgeous, haunting, lyrical prose is a delight to read and I just love losing myself in her books. I cannot wait for the final installment in this trilogy! I especially love the covers of this series. They're more than your typical "girl in a dress" cover. The detail that has been put into these covers is amazing; they really represent the story of this series! I can't wait for February 12 to come! Just reading the summary makes me so excited for Sever! I'm dying to find out what happens to Rhine and Gabriel. So what book are you waiting on? Leave a link to your WoW in the comments, and have a great Wednesday! I have mixed feelings about this series. The first book was good, the second one left a lot to be desired. But maybe she'll make a comeback in the last book. The synopsis definitely sounds really interesting, so I may have to pick this up! I do agree that the first one was better than the second, though I still love the sequel. And I agree, the synopsis does sound really interesting! I'm hoping it will be a great conclusion. Ohh, great WoW. I'm looking forward to Black City's release! I almost picked up the first book in this series a couple of months ago. The synopsis sounded intriguing, but I didn't read the greatest reviews =(. Maybe I'll give it another shot! New follower! Check out my WoW for this week. Enter my latest giveaway here-Win a book of your choice! Love your WoW, you have an awesome blog! Ooh, nice WoW! Looks interesting! Great pick! I really enjoyed both Wither & Fever! I definitely cant wait to see what happens in the end! !